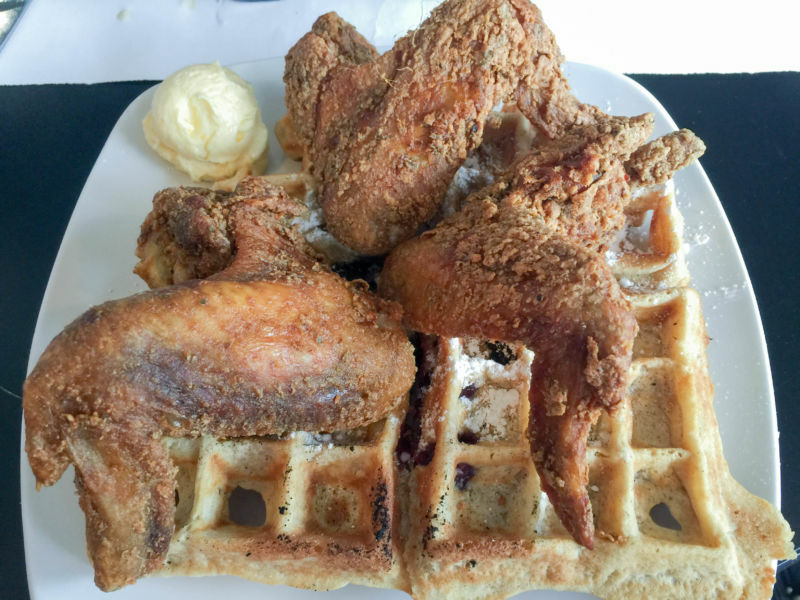 I visited Dames Chicken and Waffles for a weekday brunch before checking out the wine scene at North Carolina’s own Chatham Hill winery. We wanted to make sure we lined our tummies with something hearty before partaking of the local grape. I was joined by my partners in crime my niece Liane and her husband who write the blog The Triangle Review. They are Durham locals. They are young, hip, and in their twenties. They write about food, culture, concerts, and all the happening things in their city. It’s an interesting and fun blog to read. I arrived early to get a table at Dames as I heard that this place gets packed. I was told that I would not be seated till my entire party arrived. That did not make me happy. Thankfully, they did have a table when the rest of the group joined me. I thought that the hostess was a little rude to be honest. The restaurant was busyish, but not packed. Our waitress arrived and although nice, I could hardly hear her. She spoke in a teeny-tiny voice. I asked her what she suggested and honestly I couldn’t even understand what she said. She made no effort to move closer to me, she just stood there. I am not hard of hearing. I looked at the menu and ordered randomly, hoping it would be good. Now the thing about Dames is that they do gourmet chicken and waffles. They do several types of waffles with several types of schmear, which is a flavored butter. You get to mix and match. You can also choose what kind of chicken you want; be it wings, legs, or a cutlet. The combinations were very innovative and interesting. I tried the Carolina cockerel: a blueberry waffle with peach and apricot schmear; topped with three plump chicken wings. My niece had the red crested rose comb: two chicken legs, a classic waffle, candied pecans, and strawberry schmear. My niece’s hubby had the frizzled fowl: a panko crusted chicken cutlet, a classic waffle, blueberry schmear, and drizzled with plum sauce and almonds. Let’s start with my plate: I wish I could say that I loved my food. It sounded like it could be amazing but here what was wrong with it: First of all, the waffle was not cooked correctly. It’s texture was a little doughy. It was not light and crispy to give you that perfect “yumm” factor. In addition, it had charred places on it (see photo at the top of post). Sadly, I was not impressed with the flavor. I sample bites of each item individually so I can gauge the quality. I don’t add butter and syrup until I eat it plain first. It was just mediocre; I was bummed. On the other hand the chicken wings were good. The coating on them was excellent; with great flavor. I liked the schmear and loved the concept of the flavored butters. As sides, I ordered the mac n cheese and the collard greens. 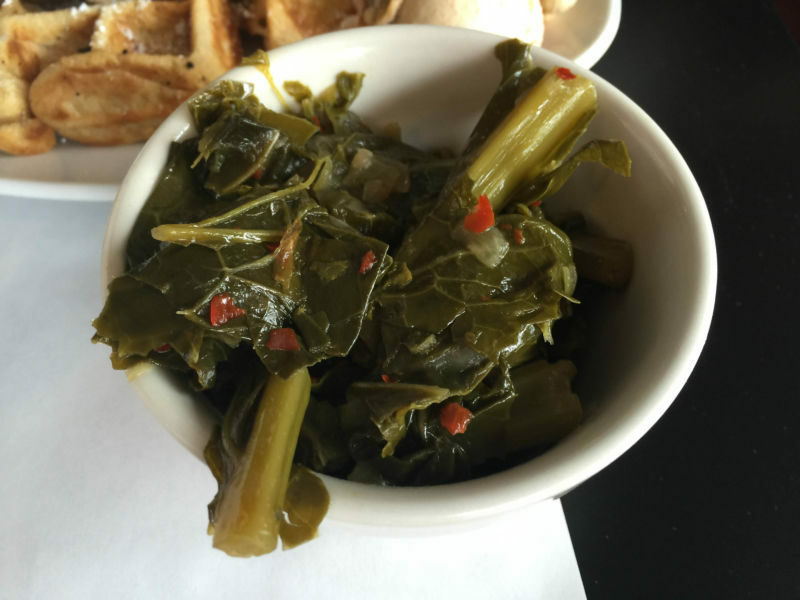 I liked the collard greens; they tasted fresh and well cooked, without them being killed. 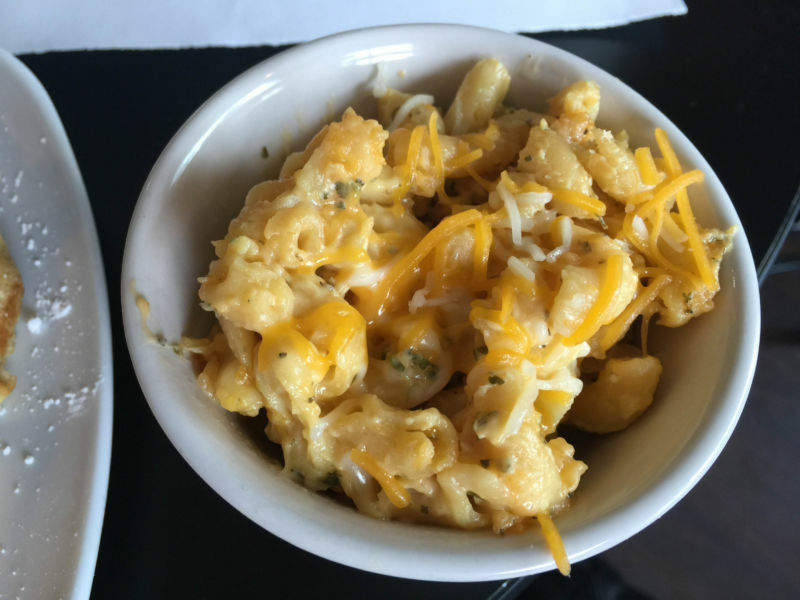 However, the mac n cheese was just blah. The red crested rose comb was again only okay as far as the waffle quality, but as an overall taste it was good. I liked the combination of flavors. It was a classic waffle with candied pecans and a strawberry schmear. I did not try the chicken legs, but my niece seemed satisfied with their flavor and cook. They looked like the wings and had the same coating. The frizzled fowl was my least favorite. My niece’s husband ordered this item with the chicken cutlet. The chicken was overcooked. This was a downright shame. How can you call yourselves a chicken and waffle place and not know how to cook chicken? It was like sawdust! Had it been my plate, I would have sent it back. Having said that, the rest of the waffle was definitely innovative and interesting with the blueberry schmear and the plum sauce topped with the almonds. The restaurant was gorgeous and I am told it’s very popular. I loved the idea of it, but I had way better chicken with waffles and definitely better service at 1313 Main in Napa. Come on, I’m in the South? No southern hospitality, no amazing chicken and waffles. What is wrong with this picture? Really, out of my entire trip to North Carolina, only this restaurant let me down. Maybe this restaurant has become too popular and allowed its standards to slip. I don’t know. Maybe it was an off day?